Applications are due on April 15, 2014. Go to here for more information. Boulder Flycasters sponsors one or two students each year from Boulder County to attend the CTU Youth Camp. The Camp is designed to educate 14 to 18 year old students on the importance of coldwater conservation and provide hands-on fly fishing instruction. Approximately 20 students are selected each year, based on their qualifications and a written essay on why they would like to attend the camp. Camp classes include: principles of ecology, hydro-geology, aquatic vertebrate and invertebrate sampling, hydrology, trout behavior, trout stream entomology, the biology of pollution, acid deposition, and politics of conservation and human effects on the Rocky Mountains. 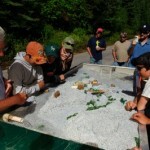 In addition, the camp will include hands-on classes such as fly tying, fly casting, streamside ethics, angling literature, streamside botany, wader safety and survival, and the evolution of an angler. Students will also participate in a watershed project to repair habitat in a nearby stream. 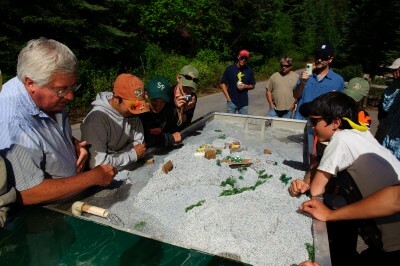 The River Conservation and Fly Fishing Youth Camp includes faculty from various environmental fields and state agencies such as the Colorado Division of Wildlife, Department of Environmental Protection and National Forest Service. The cost to attend the six-day camp is $450. Parents will receive an information packet which contains several forms that require a parental signature, after the student has been selected for the camp. All camp personnel undergo a background check through the national Trout Unlimited organization. Campers “camp out” in tents under close supervision, and are expected to bring proper equipment. Flight leaders supervise the camp and both male and females are represented. Food is catered by local company and all is cooked on the site.